This is the first of two meetings in the same place. The second meeting on the 7th and 8th is already sold out. We are having two days of meetings on June 4th and 5th in Charlotte North Carolina at COMFORT SUITES AIRPORT 3425 Mulberry Church Road, Charlotte, NC, 28208. This will be right at the airport to make it easy for people who fly in. This meeting will be focused on Resonance and Nonlinear Engineering with high frequency (Don Smith type of systems) which will also be applied to our new model motors in what we have called the third stage process. Come learn about batteries, how to rejuvenate and keep your batteries, and about practical alternative energy solutions. Watch as we demonstrate motors powering lights, fans, generators, etc., while charging batteries at around the same rate as the batteries powering the motors are discharging (which is thought to be impossible). We have been doing these meetings all over the US and in Europe since 2010. Come for a day or both days. Add the Resonance kit for the Workshop. The first day will go over all the details about proper battery charging, all the battery chargers/rejuvenators we sell (these allow you to restore most useless batteries and keep them), an introduction to the free energy motor systems, overunity demonstrations, and we will spend some time doing a workshop where people can build the new Resonance Induction Coupler Kit or watch others build it. $150 includes both 10 hour days (and if you want one Resonance kit for $80 (comes with large book and DVD) we will be assembling them on Friday afternoon). and 10 Coiler and mini 4 DualPole in self-running mode. Last weekend (this was several years ago now) we had the best Convention Workshop ever. It was a small meeting due to being the holiday season but it was enjoyed by all. The highlight of the meeting were two different motors running while their batteries were charging. That is not only were the secondary output batteries charging but the primary batteries powering the motor were also kept in a charging state as additional loads were placed on the output of the motor. We also gave the background information about what we were doing to the system. We started off the meeting showing the little mini magnet motor kit powering the mini DualPole kit, and then later the mini DualPole kit self-sustained while we added various LED loads on the output. Later we ran the 10 coiler DualPole kit with only 2 of the motor coils hooked up to circuits. 8 motor coils and 10 generator coils were not connected (due to lack of time) but placed a significant load on the wheel rotation. The motor was run at 24 volts and around 5-6 Amps. Three 9000 lumens 100W LEDs were powered and a stove top cooking element was heated on the front side of the circuit, while 24V of golf-cart batteries were being charged on the secondary side. When we added another 'open paths' process to the system everyone could see the three LEDs go to full brightness, the primary battery stop discharging, and two 11000 lumens LEDs go to full brightness (we had to cover them they were so bright). This demonstration ended up damaging one of my clamp ampere-meters due to the very amplified negative energy intensity. 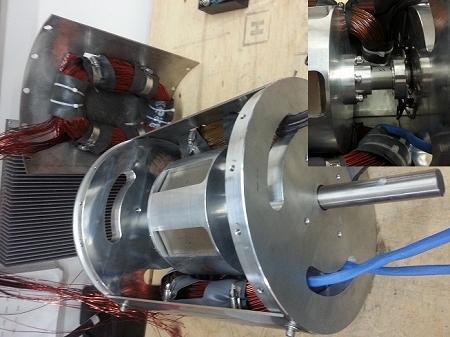 We also showed how the industrial 12” magnet motor can power a 10KW generator while charging batteries. Also shown was the larger 4 DualPole motor running a large industrial fan at variable speeds with our water-cooled mosfet controller. The setup represented a forced air heating or cooling and lighting system. We powered 4 100W LEDs very brightly with the generator coils at the same time. The motor was run on 24V of 35AH batteries up to 50A and charged two more of the same batteries at the same time. ATTENTION: THIS IS NOT A STORY-TELLING EVENT BUT A LIVE DEMONSTRATION OF OVERUNITY SYSTEMS. TIME WILL BE GIVEN TO ANSWER YOUR PRACTICAL APPLICATION QUESTIONS. DON'T MISS THIS HISTORIC MEETING. To learn about cutting edge technology that is changing the world. To meet other like-minded people and make personal and business connections. To participate in workshops where we build these systems together the right way. To have lots of fun and to be amazed! The Ten Coiler DualPole Motor in the new configuration. Presenting the Renaissance Charger collection. Going over the details about battery charging. Explaining the operation of the 10 Dualpole Motor. Contact us at sales@r-charge.com to arrange to bring your batteries to be used and/or rejuvenated during the meetings.